Hei, niin uutta, että vielä sormia polttaa, hah! Eilen tilasin uuden Mo Manning'in kuvan (kuvia). Illalla tulikin kaverilta pyyntö tuoda tyttövauvalle kortti. Ihan pakko oli heti kokeilla tehdä tästä kuvasta. Hi, a brand new baby card, made yesterday evening! I ordered some new Mo Manning's images yesterday. My friend called and asked if I have any baby cards left, she needed one for a new winter baby girl. I have some in stock, but have to make one trial with this new image "Jessie". Diecuts: heart Simon Says stamps, Spellbinders labels 11; Memory Box Chloe Stem; text: for a baby girl ( in finnish) Paperisade. flowers, dots embossing folder, embossing tinsel (snowflake) on stems. Aww such a beautiful and adorable card Mervi. Thank you for joining us at Crafty Cardmakers. 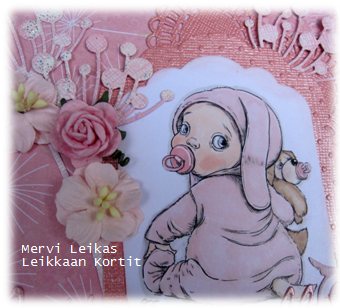 Cute baby card Mervi. Thanks for joining us at Crafty Cardmakers. This is such a cool card. Love the image used for it. A gorgeous new baby girl card. I love your new Mo Manning image, which you have coloured wonderfully and your pink papers and embellishments work perfectly together. Thanks for joining our challenge over at Crafty Cardmakers. Sally.x. This is fabulous, such a cute image and pretty pinks. Thank you for joining us at Di's Digi Designs. This is soooo cute Mervi. Lovely image and great creation. Thanks for playing along with us this week at Craft Your Passion. Hope to see you again. Good Luck. Lovely new baby card. Thanks for joining us at Crafty Cardmakers this time. Thank you for entering our 'New' challenge at Crafty Cardmakers. Pahoittelut, että olen hieman myöhässä DT-hattuni kanssa viime viikon Crafting From The Heart -haasteen kommentoinneissani. Kiva kun osallistuit haasteeseen ja toivottavasti olet mukana myös tänään startanneessa haasteessa.